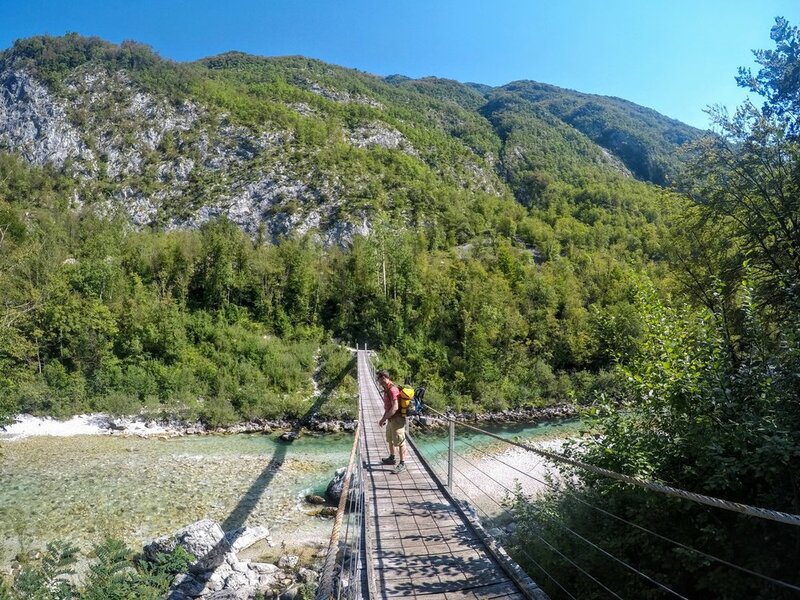 The Soča valley around Bovec is a spectacular steep-sided cauldron, set amongst the Slovenian Alps, just a few miles from the Italian and Austrian borders. Two rivers flow into this scenic plateau but only one flows out, down a boulder strewn gorge. 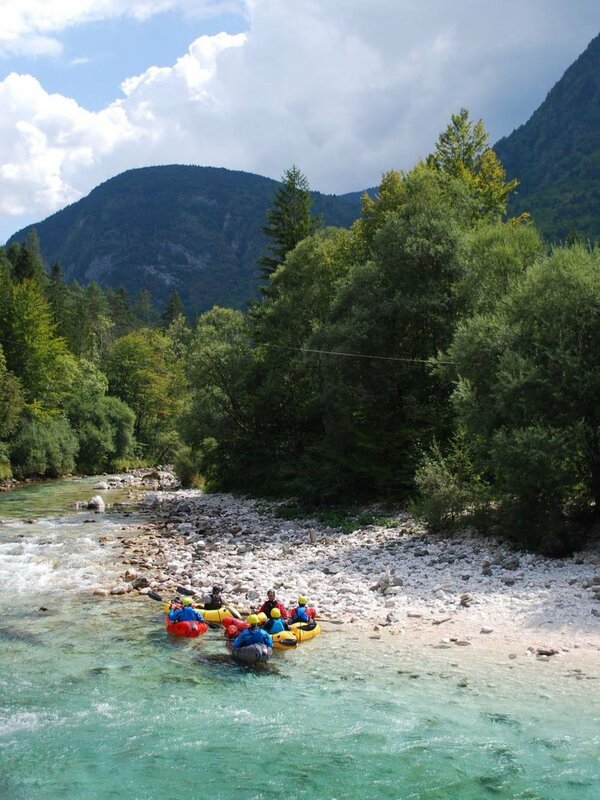 The first thing you notice about the Soča and Koritnica rivers is their stunning turquoise colour, created by clear alpine waters flowing over a bed of white limestone sand. 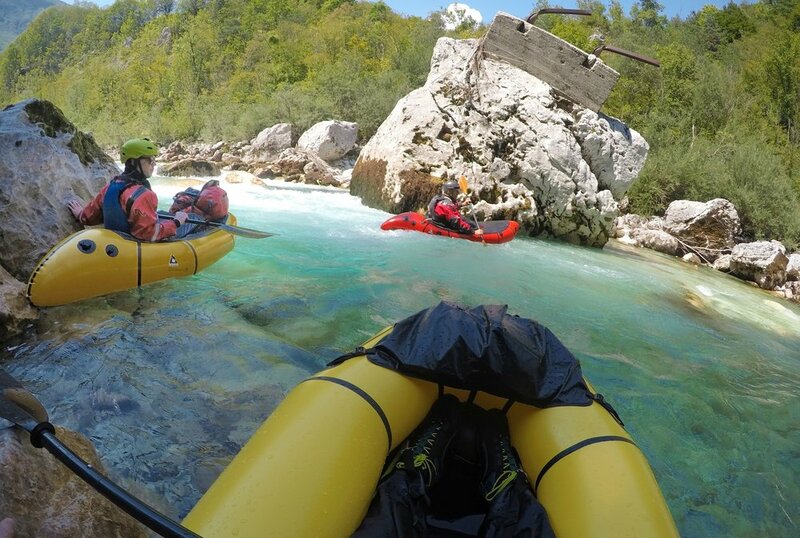 Five of us from the the UK joined a group of Germans, Italians and an Israeli attending a packrafting course run by Sebastian and Andy from Land Water Adventures. 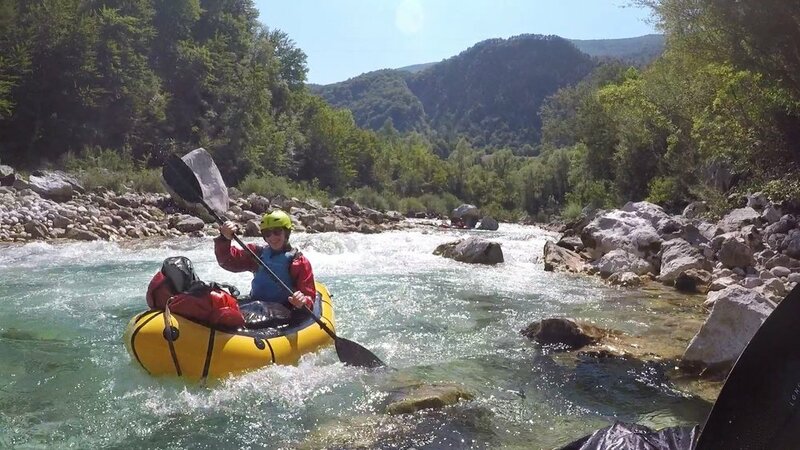 The plan was simple: three days of packrafting down two of the most beautiful rivers in Europe, each day becoming increasingly more challenging and technical, culminating in the Cemetery Run. It transpires that every rock and rapid has a name on the Soča; Takahashi’s Castle is a massive boulder, which you have to battle through whitewater to reach, whilst Priest Killer is a rapid, which if miscalculated can result in you being swept into, and trapped within, an underwater rock cavern. Many other shouted names were lost as we swept past rocks or through rapids. Sebastian and Andy are German and speak near perfect English, but occasionally above the roar of the water, words got lost in translation. Still with help of gestures we got the gist: don't get swept in there, otherwise very bad things will happen to you. They are both great coaches, who expertly demonstrated a variety of techniques and shepherded our disparate group down each section. Each day built on the last and they gradually increased the pressure, talking about the challenges of the next set of rapids, which led us to Google the slightly disconcerting number of canoeist and rafters that have met an untimely end on the river. We used a of wide range of packrafts, including Alpacka, Kokopelli, MRS and Longshore, which allowed us a great opportunity to test each. 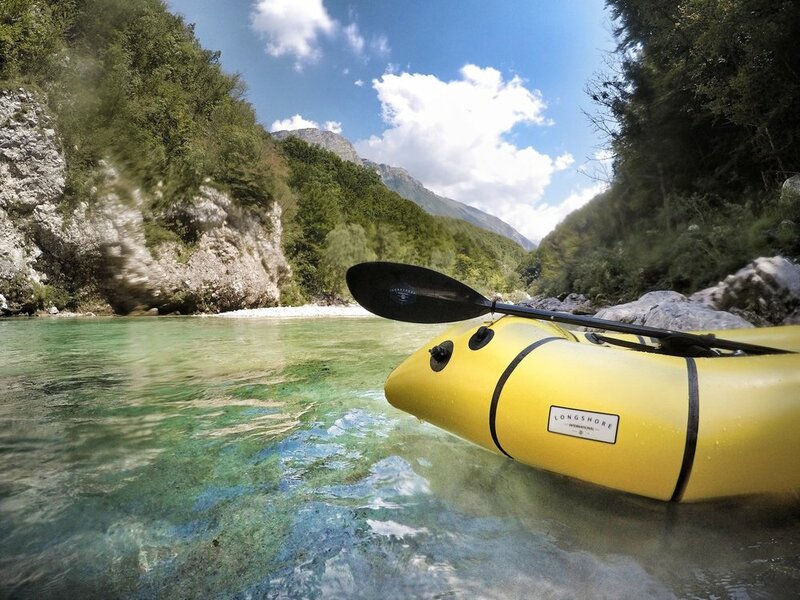 It swiftly became apparent that each provided a vastly different paddling experience. The Alpacka Alpackalypse and MRS Aligator were were by all accounts incredibly manoeuvrable and fun, but also, in an understandable trade-off, fairly unstable with the guys paddling them spending a fair bit of time underwater. The Alpacka Gnarwal and Alpacka Series were stable workhorses. The MRS Microraft seemed the least fun in these whitewater circumstances, with the person paddling it struggling to keep up and finding it quite tippy. The Kokopelli Rogue and Longshore SB260 were incredibly stable and fun. Personally, I like being able to easily jump in and out of a self-bailer when portaging and, if it turned over, there was no worry about getting caught up in a whitewater spraydeck. Another feature I liked about my Longshore SB260 was the TIZIP, which enabled me to keep my backpack and most of my kit inside the raft. If you’re thinking about buying a packraft but are unsure, I’d highly recommend you get yourself onto a course provided by Land Water Adventures (or Tirio if you want something closer to home), where you have the opportunity to try out a variety of different packrafts and learn new skills. We flew into Venice and had a pleasant two hour drive into Slovenia broken up by a visit to the Sfriso Winery, which I would highly recommend. We stayed in Camp Liza which was clean and friendly. There is a good supermarket in Bovec, where we were able to buy our breakfast and lunch each day. I’d also recommend the Gostišče Vančar restaurant in Čezsoča and the Black Sheep in Bovec, where many of the rafting guides congregate.